Last year, Christmas was sort of a sad affair around our house. Both Scott and I had been working so hard, nonstop, in the weeks leading up to the holidays that we failed completely to even get a Christmas tree (I still remember us trying to get one on Christmas Eve, and driving up to find the tree lot fenced off and dark). But all was not lost, because we were planning our Mad Men / early 60's themed new years party, and I was determined to go all out. 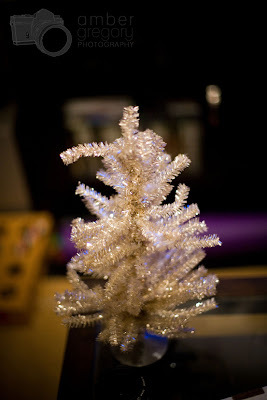 Among many of our decorations, I ordered this gorgeous little tree as a centerpiece. It was supposed to arrive before new years eve. WRONG. It actually arrived a few days into 2010. Oops. I had at this point gone through so much trouble for us to have a tree, for two different holidays, and failed--so I decided that this tree would go up on our coffee table and stay there, permanently, as a show of defiance. Plus, its so pretty and sparkly! Despite Scott's many protestations over the first few months of the year, the tree has stayed on the table, and now we're approaching the holidays again. I shot a photo of the tree yesterday with the lights from the TV shining on it, and something about it got me really excited about Thanksgiving and Christmas. Its hard to believe another year has passed already.